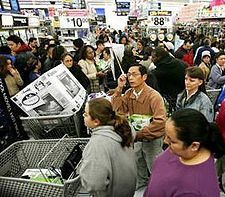 Last year, for the first time, my wife thrust herself into the heaving, pulsating mass of depraved shopaholics at our local mall on Black Friday. She says it was a horrible experience, and she’ll never do that again. But can’t you get great deals on Black Friday? Isn’t a 300-inch HDTV for $99 worth camping in front of Bust Buy for a week? Not necessarily, especially since, aside from a very few come-ons, you can do better shopping online almost any day of the year than you can on Black Friday at a physical retailer. And even if you must attend a shopping event to make you feel like a true-blue American Christmas shopper, why not make it Cyber Monday, which you can experience from your computer at home? You’re a smart, hip (at least in the sense that it’s hip to be square) computer user, right? You have NewEgg’s URL memorized. You’ve at least heard of Tiger Direct. And even if you live thousands of miles away from the nearest physical Fry’s store, you know you can shop at Frys.com from anywhere in the USA, not to mention many other locations in our solar system. So you are not going to the mall or a big-box store on Black Friday, right? One thing that happens is that super-bargains sell out early. If you’ve gotten dressed and driven or taken public transportation to Tar~Martor Best Gregg or some other store, you are going to be severely disappointed if they have no more $19.95 video game consoles when you get there. With Internet shopping, no big deal. Pour yourself another cup of coffee or get another soda, then look for the same deal at another website. If you find it, great. If not, try again in a few days. The Internet isn’t planning to close any time soon. My super-shopper wife knows that the best deals come after Christmas, not before. This is true no matter how big a font retailers use to scream YEAR’S LOWEST PRICES at you between Nov. 23 and Dec. 25. Of course, going to a retail store the week between Christmas an New Year’s Day is almost as hectic as going on Black Friday, with the added bonus that a lot of the merchandise there has a picked-over look, with battered boxes and nearly everything covered with finger smudges. Online, you have no such problems. Hopefully you keep your monitor screen and keyboard as clean on Dec. 28 as you do any other time, and items shipped to you from a warehouse probably haven’t been picked at by throngs of Christmas-maddened shoppers. This is kind of a “first tablet-like device” for a kid who is not ready to be trusted with a real computer. $26.99 (with free shipping), reduced from $44.99. A good gift for a small nephew or niece. If you’re extra-considerate, include 4 AA batteries so they can keep playing after they use up the ones that come with the thing. Target has Seagate 750GB USB 3 drives for $39 in-store, which dealnews.com says is $41 less than they’ve seen similar drives before. They also have links to a lot of other HD deals. Hard drives seem to get bigger, faster, and cheaper almost every month. There’s no excuse not to have all kinds of storage — and backup storage — these days. 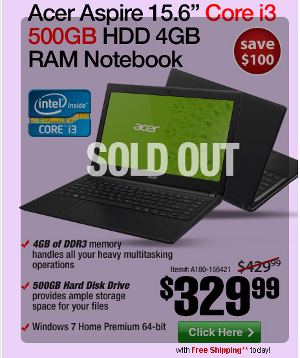 TigerDirect (which has absorbed CompUSA and Circuit City) has a whole bunch of early Black Friday deals. If you miss this promotion, don’t despair. Tiger will surely follow up with Cyber Monday specials, which will be followed by pre-Christmas, pre-Hanukkah, and pre-end of the Mayan Calender specials. Tiger is like that. In any case, happy Thanksgiving. And in case you were wondering: yes, there is an app for that. In fact, there is a crazy heap of free Facebook Thanksgiving apps, all just waiting for you to inflict them on friends (like me) who have no interest in Facebook apps.